The NITI Aayog CEO delivers keynote address at the US-India Startup Forum in New Delhi, hosted by The American Bazaar. 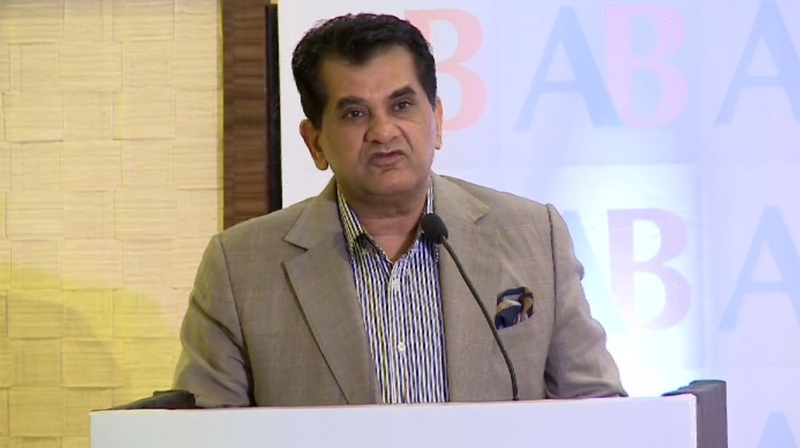 NITI Aayog CEO Amitabh Kant delivering the keynote address at the US-India Startup Forum, hosted by The American Bazaar in New Delhi on September 1, 2016. NEW DELHI: India needs innovation in the social sphere as the problems being faced by the country are different from the west, said Amitabh Kant, the CEO of NITI Ayog (National Institution for Transforming India), the central government institution for catalyzing economic development, at the US-India Startup Forum organized by The American Bazaar in New Delhi, on September 1. “My view is that India requires innovation not only in the digital world, but in the world of agriculture, in the world of education, and it will be very difficult for India to make a quantum jump in education and health and in the social world without innovation,” said Kant while delivering the keynote address at the meet, held at The Lalit New Delhi. Kant, a member of the Indian Administrative Service, said that the e-commerce market in India will grow up to $300 billion by 2024. “I expect this is (e-commerce market) going to grow up to about $300 billion by 2024 simple because India is the only country which, by 2024, will have close to a billion smartphones. It will be the only country in the world which will have a billion biometrics,” he said. The daylong startup forum consisted of a number of panels, investor pitches, and speeches by prominent investors, experts, and entrepreneurs. The afternoon session of the startup forum began with ‘elevator pitch,’ which saw startup entrepreneurs pitching their business plan to the audience. Three participants were selected and the winner will get a chance to fly to the United States and meet investors to fund their startup. Dr. Mukesh Aghi, president of the US-India Business Council, was the second keynote speaker. The panel of speakers also included Richard M. Rossow, Dr. Satyam Priyadarshy, Vinson X. Palathingal, Dr. Charan Singh, Dr. Ram Reddy, Vishal Verma, Mohsin Syed, Sri Peddu, and Anand Sudarshan. This post was updated on September 5, 2016. Hope ,future of indian ecommerce market will bring more innovative technologies in the ecommerce industry.